A dream Italian painting holiday capturing the romantic city of Verona and beautiful Lake Garda with one of our most popular tutors and staying in charming luxury boutique hotels. 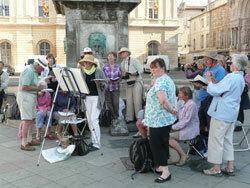 Verona and Lake Garda are two places Hazel Soan has long wanted to paint. Verona is one of the most romantic cities in the world and after Venice is the finest art centre in Venetia. Standing on the banks of the Adige, Verona is compact and easy to walk around. Famous for its Roman Arena, medieval castle and Juliet’s balcony, as well Pisanello and The Veronese School, so you will have plenty to paint over the four days here. A short drive away but in complete contrast is Lake Garda, the largest and most beautiful of lakes in Italy. Lined with numerous villages, villas and Scaliger castles and surrounded by evergreen hills, mountains and terraced lemon groves, you will find plenty of subject matter to paint during your six days here. A public boat service operates on the lake enabling you to visit all these places. All the arrangements are taken care of for you by an accompanying programme co-ordinator from the UK, enabling you and Hazel to concentrate solely on painting. In both Verona and on Lake Garda we have hand-picked two of the loveliest hotels in Italy. Both are luxury properties with lots of character, excellent restaurants and perfect locations. In Verona the hotel is a former Palazzo and museum with original frescoes and traditional parquet flooring and just 5 minutes’ walk from the Arena. On Lake Garda we have chosen an elegant 33 roomed villa with beautiful gardens and lake views. It is the most complete and best preserved example of Liberty style in Italy with frescoes of Bertolotti and Landi, large wrought iron volutes and refined wood inlay. Scheduled flights and all meals are included except lunches.